Talk about an O B S E S S I O N. Chickpeas a.k.a garbanzo beans a.k.a goddess beans a.k.a lovers of my life beans a.k.a sweet little nothing beans a.k.a Middle Eastern gems that give me L I F E ! Literally. I’m not kidding. Raw, roasted, in a soup or even in a little pesto mix—the things I’d do for some yummified chickpeas (do not even get me started) but for seriously, chickpeas are so nutrient dense and A W E S O M E S A U C I N ' for a little pick me up snack at any time between any meals for A N Y reason! Need a little extra fiber? Chickpeas. Need a little extra protein? Chickpeas. Need a little boost in your vitamins (a few being vitamin E, K, C, A, B6) + minerals (a few being potassium, phosphorus, magnesium, copper) intake? Chickpeas. Need a little extra folate to aid in essential red blood cell development? Chickpeas. Need a little extra crunch in ya’ life? Chickpeas. Need an extra little gentle explosion of nutrition lovin’ in your day? Chickpeas. Chickpeas shine as a weight loss food because one half cup of these barely contain any fat, yet, provide your body with just about 6-7 grams of protein + around 20 grams of energy-providing complex carbohydrates. The dietary fiber that chickpeas obtain aids in weightless by creating the feeling of satiety. Satiety is the feeling of being full. The soluble fibers absurd water, fills the stomach + sends little signals to the brain telling you that you're full so you don't over eat. 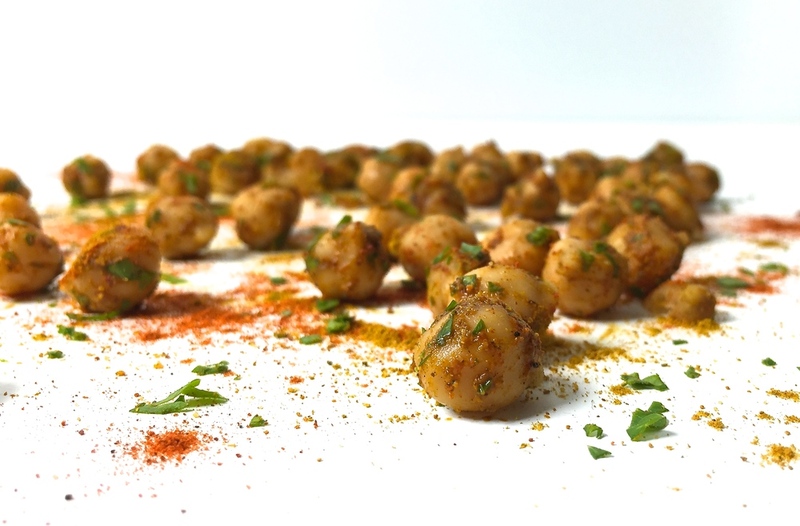 H A Z L ‘s favorite way to indulge in chickpea h e a v e n (so many ways so l i t t l e time) but I would have to say that my most desired way to eat chickpeas would be tossing them with a hefty portion of curry(for me, I don't measure . . . . . I just shake enough curry on so that the chickpea's becoming that vibrant green/yellow-ish color) + a few drizzles of grape seed oil (or coconut oil) and a pinch of sea salt in a pan—sauté the mix just for a few minutes to get a crispy outer shell—and then to add a pop of color, I toss in a sliced roasted red pepper (or any color pepper) and B O O M, there you have it. This is down right K I L L E R and practically could live off of this (no joke!). You can do so many different things with chickpeas that they've become one of my most sought after versatile ingredients—I just cannot get enough. Try tossing some chickpeas into a stew or salad, blend them in a food processed + add A N Y sort of fruit or veggie to make a spunky little hummus dish (creativity is everything) OR roast them in the oven with some fresh rosemary + thyme for a a crunchy little snack throughout the day (this is my 2nd fave way to eat chickpeas) and the list can go on and go B U T let's be real, the chickpea world is Y O U R oysters, have at it! Just a little side note: I always try to buy dry chickpeas and soak them over night simply because this way no nutrient values are lessened or l o s t in the canned shelf-life process. HOWever, I’m guilty of grabbing a can or two (or three or four+) 9 of chickpeas when strolling down the isle because let’s BE real . . . . . . c o n v e n i e n c e just gets the best of me sometimes! It’s okay, no one is perfect and I am no judger of chickpea buyers (as long as you’re buying them, ILY)—just make sure to rinse the chickpeas thoroughly until the water isn’t bubbly and rinses through the chickpeas easily to ensure that most of the sodium and liquid is rinsed off. Yes! VWALA, that is all.